Safety and security staff is available year-round 24 hours-a-day to assist students, faculty, staff, and campus visitors. Security can be reached by calling 6393 from any on-campus phone and at 563-588-6393 from off-campus. Security can be called for routine assistance and should always be called for any emergency. 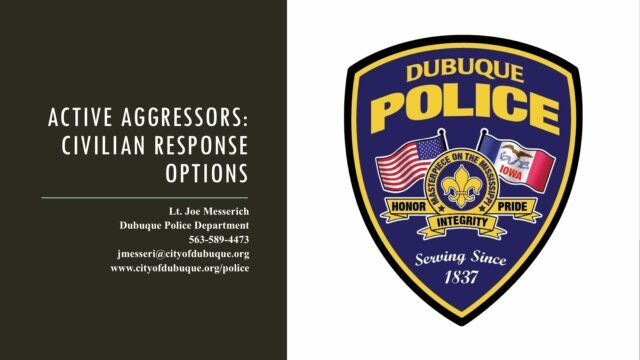 Steve Kirschbaum, Executive Director of Facilities and Security, can be reached at 6326 from on campus and 563-588-6326 from off campus Monday-Friday, 8 a.m.-4:30 p.m.
Dubuque Police, Fire, and Ambulance can be reached by dialing 9-911 from any campus extension. Security on campus is a shared responsibility. Students, faculty, and staff are asked to exercise reasonable caution on campus and to be alert to suspicious persons or activities and report them to security. Be certain that doors are not propped open or left unlocked and that unauthorized persons are not permitted to enter any campus building. Clarke University now has a Campus Alert System that can deliver time-sensitive notifications to students, faculty and staff. The system is powered by Connect-ED®, a rapid, multimodal communication service that provides the ability to reach students, faculty and staff with information and updates during unforeseen events or emergencies. Within minutes, the system can reach those enrolled in the system through phone calls, e-mails and/or text messages. The purpose of the campus alert system is to reach students, faculty and staff more effectively by using their preferred communication channel. If you haven’t already signed up for alerts, log in to your MyInfo account and select the “Student Alert Notification” tab under the Communication heading. It’s a great, free service for students! Parking Fees can be made online or at the Student Accounts Office (202 Haas Administration). Clarke University is private property. The right is hereby reserved to issue parking tickets and deny the use of campus parking areas and lots to unauthorized persons, and to those who violate Clarke University parking regulations. Clarke University reserves the right to tow unauthorized vehicles at the owner’s expense. Payments of parking fines are to be made at the office of student accounts (202 Haas Administration) during regular business hours. Arrangements for appeal begin at the safety and security office (MJH G27) within 5 working days of the citation date, by calling 588-6326. If there is no appeal made within 5 working days of the citation, the ticket cannot be appealed. Unpaid fines will be deducted from the faculty/staff member’s paycheck. Purchase your parking permit online. Students can purchase a parking permit at Student Accounts or online. If a student does not have a current parking permit properly displayed on the left rear bumper or window of their vehicle, it will be ticketed if parked in any of the campus lots. Temporary parking permits are available in the safety and security office. If a student has a visitor coming for the weekend, a temporary parking permit may be obtained for the visitor. Temporary parking permits are also available to students who need one; for example, if their car is being repaired and they are using a temporary car. Temporary permits are only good for two weeks and they may not be used repeatedly in place of a regular parking permit. Faculty/staff vehicles parked on Clarke University property must display a current Clarke University parking permit on the left, interior side of the rear window of the vehicle. transfer the static cling permit from the old vehicle to the new vehicle. E-mail Steve Kirschbaum, Executive Director of Facilities Management, that you have switched vehicles and have placed the parking permit on the new vehicle. Include vehicle information from the old and new vehicle for updating records. If you have more than one vehicle, a permit should be issued to each vehicle. There is no charge for the permits, which are available in the safety and security office (MJH G27). If a faculty/staff member would like to request a key/chip, it is necessary to receive approval from their supervisor. A key request form can then be completed online. If a faculty/staff member loses their key/chip, they need to come to the security office (MJH G27) to get a replacement. The replacement cost for a lost key is $100.00 and a lost chip is $10.00. If the replacement cost is unpaid, it will be deducted from the faculty/staff member’s paycheck. If a faculty/staff member leaves Clarke and does not turn in their key(s) and chip to the security office, the unpaid replacement costs will be deducted from their paycheck.